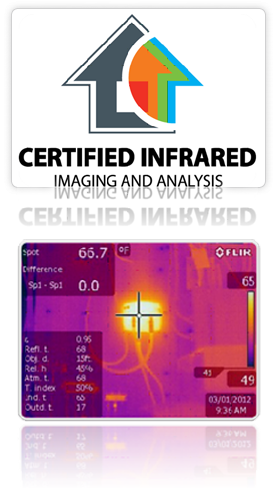 Thermal imaging or Infrared Cameras measure the surface temperature and displays the data as an infrared heat spectrum. 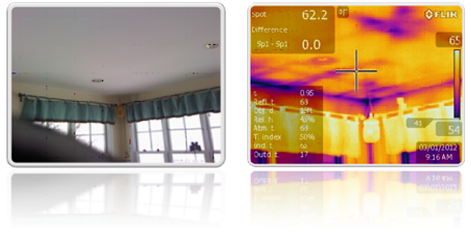 Displaying heat as a visual image makes it easy to identify where energy is being lost and wasted to the outside. Building, Renovating, Buying or Selling? Verify you are getting what you are paying for. Ensure that the insulation job is done right before it gets covered up. Use the knowledge gained to negotiate a fair price weather you are buying or selling. Energy Costs Are Out of Control, Get Your Costs Under Control! To increase the value of your home by making it more energy efficient. Before you sell your home. Before you buy a home. Before installing solar or renewable energy. Before replacing your HVAC system. Before you renovate your home. To improve your home comfort or health issues. Often sections of walls and ceilings have inadequate or no insulation. Hidden gaps and deteriorated weather sealing are frequently found where significant energy is being lost and water infiltration is occurring. Finding and fixing these spots will save money in costly repairs down the road and will reduce energy consumption. Other problems include displaced insulation, drafts at electrical outlets, switches, ceiling fans and lights, poorly sealed or settled windows and doors to name just a few. Drafts can cause condensation within walls, floors and ceilings that cause many problems, but often show no visible signs. Wet insulation, sheetrock and wood is a prime location for mold and fungi to form and invites ants and other insects to nest. Moisture problems can be detected early. When water can penetrate from roof leaks, leaking plumbing and heating pipes inside walls and foundation cracks you have the potential for rot and insect damage over time. Hidden leaks , even small, will over time decay the structure of your home.